My name is Daniel L Carter and my blog's name is A Christian Man's Perspective. What do you usually blog about? I don't know that there is any one topic that I write about but more often than not I write book reviews, about society in general and relationships. I'm doing a lot of interviews with both bloggers and authors which has been a lot of fun. On occasion I'll throw in a movie review or a fun video or article I find interesting. I really liked your article about Cellphone Zombies. But what led you to start a blog? Squidoo invented a new type of lens, aimed at lovers of pets. Okay, I couldn't resist. So why do Squidoo games, with trophies, points and encouragement to read and comment (participate I guess) have such an attraction for me while I continue to overwork the "ignore" button on all Facebook's games? 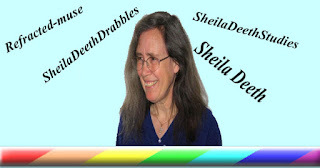 See, Featured interview with Sheila Deeth to read our conversation. He's a really good interviewer. And if you click on his newer post you can read about zombies on cellphones! Meanwhile, I've collected those 365 pieces ready to release them on my lulu store. And I've got a set of home-made "birthday books," one for each month, with a drabble for every day--sort of a readable birthday card. I didn't manage to sell them at the summer fair, but I'll try again at Christmas... or you can email me for more information. So... drabbles, dribbles, snippets... what do you think I should do for my daily writes next month? Dancing Round the Room again!!! I got the email this morning. Gypsy Shadow have said "yes" to my second ebook! Black Widow: a story of passion, love and betrayal, set against a backdrop of historical England and legendary spiritual powers. So I'm dancing round the room again, and even the gray and the rain can't dampen my mood. Thank you, thank you, thank you, Denise and Charlotte, and Gypsy Shadow! The speaker at our writers' group was Ellen Urbani, author of When I was Elena, published by the Permanent Press. She gave a wonderful talk, about what makes a memoir different from a journal, choice of characters and creation of voice, how an agent or publisher might define truth as fiction, how hard it is to sell books that cross genres even though crossing genres might be what makes your book unique, how current events effect sales and the questions asked in interviews, the need to have answers even when your interviewer hasn't read the the book, and the relative advantages and disadvantages of small publishers over big ones. She was fantastic! Of course, I'll never write a memoir, but I can't use my favorite reason anymore. Ellen said she didn't like keeping a journal, and there was I thinking memoir writers couldn't exist without one. Ah well, so much for that excuse. I was trying to catch up on posting all my reviews yesterday. All went well till LibraryThing suddenly stopped talking to me. It took a couple of failed attempts before I gave up and read the error message. But now I know I'm only allowed 200 book reviews there unless I pay for premium membership. Not that premium membership's expensive, but it's the thought that counts... How could I only read 200 books? So now I'm wondering if I should delete some old reviews to add new ones, or just stop bothering to post to LibraryThing. Any suggestions? Would anyone care? Of course, I could pay them, but who wants to do that? There's always Goodreads and Shelfari, Amazon, Barnes and Noble etc... They're all free and they haven't told me to go away yet. And Goodreads has some pretty fun book groups too. As usual, click on the links for my Gather reviews. I've certainly enjoyed my reading time this week. And if you want to know more of my writing journey, just click on the link to visit my "Refracted" blog: I'm blogging this week there about how I learned to write. God and Dog--the most amazingly simple, fun and uplifting tale of unconditional love for dog-lovers everywhere, and don't forget to visit the video too; there's a link on my review. Underground and Vanished--the next two in Kat Richardson's Graywalker series. I think I'm hooked. Great female protagonist. Nicely imagined paranormal world firmly anchored in the real, and fun tours of historical London and Seattle underground. The Poet--next on my list of Michael Connelly books--yes, I know, I'm way behind. I really enjoyed this one and have just started reading the Narrows, which might be called a sequel. So what am I doing? I'm adding another "lens" to "my squidoo." Our local writing group meets on Sunday and it'll be my first time pretending to be the new "fearless leader." Not that I'm in any way fearless (I shall hide my hands under the desk so they can't see them shaking). But I know there's going to be some new people there, so I guess we'll have to start by going round the room introducing ourselves. I thought I'd add a new twist to the introductions this time--sort of a mental writing exercise to get us in the mood. I'm going to ask everyone to give us their name then say three sentences--no more; no less--that tell the story of their writing. Sentence 1: How did you start out writing? There's probably lots of things you could tell; tons of remembered anecdotes about how you took up the pen (or keyboard perhaps). But you're only allowed to pick one detail and fit it in one short sentence, because brevity is the soul of wit, and details should be used sparingly. 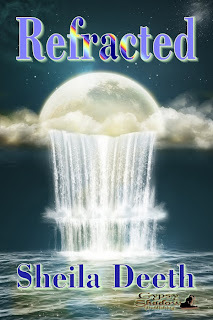 My eBook, Refracted, just went on sale on Amazon! That's so cool! Well, it feels pretty cool to me anyway. I'm looking at the picture and my thoughts are refracting and darting in different directions. Thank you, thank you Gypsy Shadow for putting it there. Second Wind Publishing's mystery anthology, Murder in the Wind, is on Amazon too, with my story, Jack, lurking inside. I just bought my copy at last and can't wait to read it. I feel like a genuine book reviewer! I just found Martin Shepherd's latest blogpost at The Cockeyed Pessimist where he writes about book reviews, anonymous and otherwise, and their effect on the opportunities available to authors. He mentions a new Publishers Weekly program, called PW Select, which will provide a service that, for some unspecified registration fee, will include self-published books and reviews in a quarterly supplement. It sounds interesting, though fees always scare me. But what was even more interesting was reading the quoted reviews for a few of the Permanent Press's recent releases. Squidoo didn't used to be so addictive. I'd read a few excerpts of friends' books there, wandered round the odd page, decided I liked blogger better, then made myself a web site. A little while later I was clicking that dreaded "publish" button on Lulu and they brought up a "market your book" link. It seemed like a good idea to follow it, my marketing skills being singularly negligable. Then suddenly, without knowing how, I was creating my first Squidoo "lens." I'm reading "The Poet" by Michael Connelly. It's a long book--well, relatively long--but I'm enjoying it; It has an interesting mix of first and third person writing that really works! And my husband enjoyed the story--a genuine mystery with complicated thrills--which is why I'm reading it. My husband's visiting family and carrying books to while away hours of traveling. Would he take a kindle if we had one? I'm not sure. There's something safe about dog-eared books; cheap to replace; forgiving when you spill the airplane coffee on them; and they don't mind being dropped while you frantically search through your bag. Besides, if his Dad likes something my husband's reading, it can always get left behind. What will I read next? I have a couple of ebooks on the computer waiting for reviews, so probably them. Though I'd rather curl up on a sofa--those aching legs and arms and neck after that fall. Wow. Did I really not post a list of books I'd been reading in August. I guess it really was busy month. Anyway, here's a list of books recently read and reviewing on that continuing Reading Journey. Paranormal... Breaking Dawn finally came out in paperback! Historical. Crooked River was a great young adult novel with well-researched detail and a powerful feeling of reality. Hotel on the Corner was just haunting.